How Good Is the Brother PE540D? Brother is dominating the embroidery machine market with their devices that are usually an eclectic combination of functionality, good performance and ease of use. Plus, most of their machines are affordable models, perfect for hobbyists and home use. The PE540D represents Brother’s unique effort to put a different spin on an embroidery-only machine, while at the same time keeping as many useful features as possible. We previously rated this as the best embroidery machine for beginners but you should also check out the newer model, the 550D, which comes with slight improvements. This is a small, compact, lightweight embroidery machine. The hoop size is 4 x 4 inches, which is definitely not much, but it wouldn’t be fair to hold that against Brother, since this is a machine primarily meant for home use, and it keeps costs down. The backlit LCD touch-screen display is easy to use and allows access to built-in designs, multiple editing features, tutorials and more. 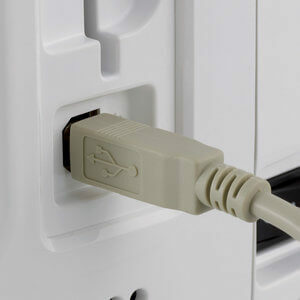 Computer connectivity is also there – you can import designs from your computer via the included USB cable or you can simply plug in a flash drive with designs and then import and save them onto the devices internal memory. The cable can also be used to update the machine’s software. A large number of built-in designs is included. 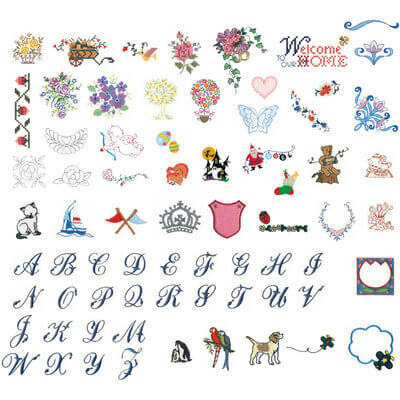 There are 70 built-in decorative designs, 35 Disney designs and 5 different fonts. These Disney designs might not mean much to some of you, but those with children will be ecstatic with the large selection of Disney character designs, from Mickey and Mini Mouse to Nemo. 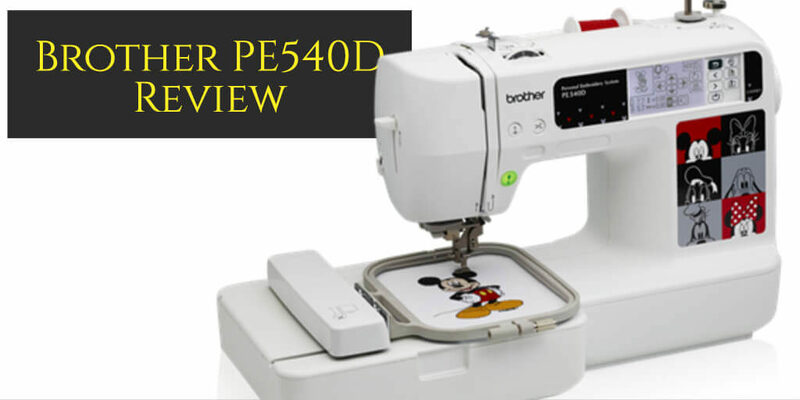 The PE540D is a really beginner-friendly model that comes with lots of instructions and diagrams meant to teach the user how to thread the machine, wind the bobbin and how to attach and remove the embroidery hoop. A see-through bobbin case is also included, so is the useful automatic needle threader. Easy to use function buttons are conveniently placed above the needle. 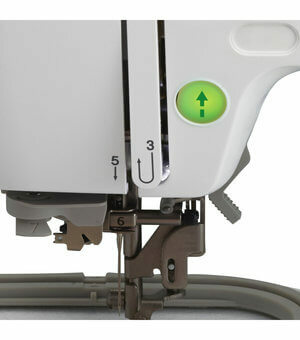 There is a start/stop button, a needle up/down button and the automatic thread cutter. The pattern can be rotated for 1, 10 or 90 degrees, which just makes things even more convenient. There is also a large number of accessories, including: an embroidery foot, 4 bobbins, extra needle sets, a lint brush, a seam ripper, 1 large screwdriver, a disc-shaped screwdriver, 4 spool caps (2 small/1 medium/1 large), a spool net, scissors, a stylus, a USB cable, an embroidery bobbin thread, an accessory bag, a dust cover, a 4” x 4” embroidery hoop, a quick reference guide and a detailed owner’s manual. All in all, the PE540D is a simple, easy to use, minimalist machine meant for beginners. It has just about everything a casual user or a hobbyist could need and more. Now, let’s see if it performs equally as well. Ease of use is really what the PE540D is all about. This shows in the performance aspect of the machine too. Even your child could use it, with very little assistance. Detailed on-board instructions are easy to follow and the menu displayed on the LCD screen is also great and easy to read – all you have to do is scroll through the list of designs and then just pick the one you want with your fingertip or the stylus (which is also included). After that, the design appears on the screen with a concise description of the thread colors you need. Perhaps the only bad thing is the speed – the PE540D is relatively slow, producing 400 stitches per minute. This is somewhat to be expected, given the price and the demographic this machine is meant for. Apart from that, the machine doesn’t really have any major flaws regarding performance. Everything works very well. Placing the embroidery hoop is also very easy, all you have to do is simply align the slots and you’re set. This machine pretty much works on its own and it is absolutely perfect for beginners or perhaps those of you who want to introduce their children to the world of embroidery. It performs well, it’s quiet, safe and easy to use. Designs created with this simple, effective embroidery machine look beautiful, as if they were made on a high end, industrial embroidery machine. In the end, that’s what matters the most. Simply put, the PE540D does what it is supposed to very well. It is not spectacular, but it is the best embroidery-only machine for beginners and hobbyists. The PE540D is the best embroidery only machine for beginners and hobbyists we’ve ever reviewed. We try to review these devices separately and we prefer to put things in context – we pay attention to a few crucial things, such as who is the machine meant for and what it is supposed to do. It would be unfair to compare the PE540D with expensive, industrial-like machines meant for home businesses. This machine is meant to be used at home and within that category it’s a solid 9. Great, fun Disney designs for children and the large number of accessories are just another added bonus. Plus, the PE540D is one of the best cheap embroidery machines out there. Probably the best product of its kind on the market.